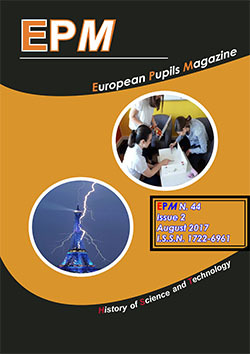 This second issue of EPMagazine on 2012 salutes the success of NASA’s project “Curiosity – science lab on Mars”, aiming to analyse samples of soil and rocks on Mars with the Curiosity rover, in search of proof that Mars could be a favourable environment for the existence of some forms of life. People have always been curious to unveil the mysteries about the Universe they are part of. From ancient times, when everything had mystical or supernatural explanations, to our present days when science has put aside many of the previous beliefs and opened new horizons, one thing remained ultimately unchanged and that is man’s curiosity. The thought that there are other forms of life that developed in other parts of the Universe still stirs many people’s imagination. This is one of the main reasons why this project of NASA benefitted from such a large mediatisation and such a huge interest from the audience. The robot which landed in the Gale crater on the 6th of August 2012 has the objective to analyse the climate and the geology of Mars and to find scientific proof of life in any forms. Among the most interesting technical details that could be mentioned here, there are the 17 high resolution cameras that the robot is endowed with, the infrared laser, the microscope, the X ray spectrometer, the several analytical labs, the various communication and mobility systems. As far as its dimensions are concerned, it is 2.9 m long, 2.7 m wide and 2.2 m high. Unlike the rovers previously sent on Mars by NASA- Mars Pathfinder in 1997, Spirit Rover in 2010, and Opportunity in 2012, Curiosity was active even from its successful landing on Mars, minimizing the preparation time to a few seconds. The rover has already taken, analyzed and photographed many samples of soil and other bright particles that were initially believed to be leftover pieces from equipments used in previous missions, but after careful examination they were proved to be made of Martian matter. Curiosity rover has also photographed white spheres on the Martian sky, explained by the specialists as dead pixels, flaws of photography, but believed by those who believe in aliens to be unidentified spaceships. Amongst the most interesting images offered by the rover there is the large dimensions rock nicknamed “Jake Matijevic”, with a complex composition of silicon, sodium, potassium and aluminium that proves it as being resulted from the cooling of the magma after a volcanic eruption. The rover has also photographed an amazing eclipse on the Martian sky, when Phobos, one of the Mars’ „moons” passed in front of the sun. The outcome of this research and the educational activity conducted by our magazine EPMagazine make us recall Albert Einstein’s famous words: The important thing is not to stop questioing. Curiosity has its own reason for existing.